Readers of Short Daily Devotions, welcome to The Inspired Legacy! Nine Ways to Be A Better Dad is a free parenting resource featuring practical and biblically-based parenting advice. It's written for dads—by dads—and provides a spiritual approach to a few of the toughest challenges faced by fathers today. If you're not a dad, it also makes a great gift for any active parent looking for guidance or inspiration. Sign up below to receive instructions on how to download your free copy today. 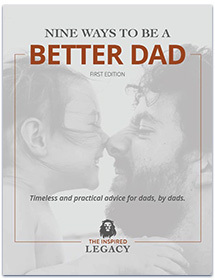 Sign up and we'll send you a link to download your FREE copy of Nine Ways to Be A Better Dad. Please check your email to confirm your request, then we'll send you a link for your free download.